Do you have ice dams forming on the edges of your roof? At first glance, they might look very pretty. Ice dams will make your home appear wintry, which is why many homeowners don’t give them a second thought. However, they can also cause extensive damage to your home’s roof and your gutter system, so you should do whatever you can to prevent them from popping up after a big snowstorm. Check out some tips for preventing ice dams on your roof below. Learn more about why ice dams form in the first place. Before you start trying to prevent ice dams, you need to learn about why they form. Ice dams form when snow melts on your roof as a result of a warm attic. Water from the snow trickles down the roof, but before it makes it to your home’s gutter system; it encounters the cold roof edge and freezes again. Once there, it collects other water from melting snow and eventually forms a large block of ice known as an ice dam. It can quickly spiral out of control and end up being very large, depending on how much snow you have on the warmth level of your roof. Find better ways to insulate your attic. To prevent these ice dams from forming in the first place, you need to reduce the temperature in your attic in the winter. You can do it by checking your insulation levels and replacing insulation. You can also do it by making sure warm air from your home isn’t seeping up into your attic space through cracks or other entry points. Sealing your attic from the rest of your home will make it colder up there and stop warm air from melting snow on your roof. Add venting to your attic, if necessary. In addition to checking your insulation and sealing off your attic, you should also add venting to it if you don’t already have enough venting up there. Vents can bring cold air into your attic space and push warm air out before it’s able to melt the snow on your roof and encourage the growth of ice dams. 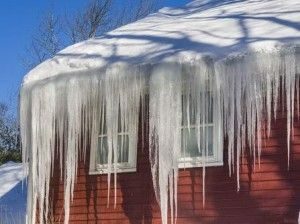 If ice dams are giving you and your family fits and you aren’t sure where to begin as far as getting rid of them, Roofing By Bruce is here to help. Call us at 570-424-7250 today, and we will help you come up with effective ice dam solutions.